Recommended to: Readers who enjoy intellectual pursuits mixed with mystery and intrigue. Three smart young women—the scholarly Ruth, her poet roommate Lucy, and their exotic, provocative neighbor Anna—are obsessed with games of all kinds. They’ve devoted themselves to both the academic study of play and the design of games based on the secret history of the neighborhood around Columbia University, from Grant’s Tomb to the former insane asylum that once stood where the campus is now. When Anna’s mysterious brother Anders gets involved and introduces live-action role-playing based on classic Greek tragedy, theory goes into practice and the stakes are raised. Told in a variety of formats—including Gchat and blog posts—that bring the fraught drama of Euripides screaming into the 21st century, The Magic Circle is an intellectual thriller like no other. 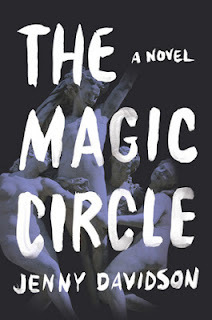 It's difficult for me to pinpoint exactly how I feel about The Magic Circle, but I can absolutely tell you that this is a very different kind of read. Meshing together history and gaming with the concept of human nature, I was definitely not expecting what I found between these pages. This might sound like your normal mystery or thriller book. I can assure you, however, that it is not. The Magic Circle starts out very deliberately by explaining to readers, through dialogue mostly, what it means to "game" and how this will affect the characters in the writing to come. It was a little tough for me to push through the first fifty pages or so. Jenny Davidson does a nice job of introducing the main players in this story, but it is almost buried under the amount on information that is offered up at the same time. I didn't really feel that I was able to meet Ruth, Lucy and Anna until much later. Which brings me to my biggest issue with these women, actually. I understood that they were graduate students. I understood that they were intellectuals. However the dialogue and the way that they interact all seemed so stilted to me. I'm a well read person. I enjoy deep and thought provoking reads. Yet I had no idea that there would be such a dense amount of vocabulary in their conversations. It was almost as if their copious drinking was thrown in just to show they were college students. Once the book does take off, essentially once Anders enters the scene, it becomes much easier to follow along with Davidson's characters. The mystery aspect is there, mixed in with the concept of showing dark desires we all possess. By the time I was at the end, I was much more invested in the book. I raged when I realized that the book was nearing its end, and I likely wouldn't have all of my questions answered. The Magic Circle was a bit of a roller coaster ride for this reader. There were parts I pushed through, others I devoured, and at the end I couldn't quite decide how I felt. I honestly still can't. What I can say is that this is a different read, and worth a read if for no other reason than that. Go into this with an open mind and you might just find a new read to love.